Now when the Lord was about to take Elijah up to heaven by a whirlwind, Elijah and Elisha were on their way from Gilgal. Elijah said to Elisha, “Stay here; for the Lord has sent me as far as Bethel.” But Elisha said, “As the Lord lives, and you yourself live, I will not leave you.” So they went down to Bethel. The company of the prophets who were in Bethel came out to Elisha, and said to him, “Do you know that today the Lord will take your master away from you?” And he said, “Yes, I know; keep silent.” Elijah said to him, “Elisha, stay here; for the Lord has sent me to Jericho.” But he said, “As the Lord lives, and as you yourself live, I will not leave you.” So they came to Jericho. The company of the prophets who were at Jericho drew near to Elisha, and said to him, “Do you know that today the Lord will take your master away from you?” And he answered, “Yes, I know; be silent.” Then Elijah said to him, “Stay here; for the Lord has sent me to the Jordan.” But he said, “As the Lord lives, and as you yourself live, I will not leave you.” So the two of them went on. Fifty men of the company of prophets also went, and stood at some distance from them, as they both were standing by the Jordan. Then Elijah took his mantle and rolled it up, and struck the water; the water was parted to the one side and to the other, until the two of them crossed the dry ground. When they had crossed, Elijah said to Elisha, “Tell me what I may do for you, before I am taken from you.” Elisha said, “Please let me inherit a double share of your spirit.” He responded, “You have asked a hard thing; yet, if you see me as I am being taken from you, it will be granted you; if not, it will not.” As they continued walking and talking, a chariot of fire and horses of fire separated the two of them, and Elijah ascended in a whirlwind into heaven. Elisha kept watching and crying out, “Father, father! The chariots of Israel and its horsemen!” But when he could not longer see him, he grasped his own clothes and tore them in two pieces. Elijah said to Elisha, “Stay here, for the Lord has sent me as far as Bethel.” But Elisha said, “As the Lord lives, and you yourself live, I will not leave you.” So they went down to Bethel. In 1940 John Lewis was born into a poor sharecropping family in Alabama. He was raised in such a way that he was forced to skip school and help on the farm, to which he decided to rebuff his parents and run out to the School Bus when they weren’t paying attention, knowing full and well that punishment would come when he arrived home in the afternoon. He eventually left Alabama to attend school in Nashville, Tennessee, and it was there that he became involved in the Civil Rights movement, helping to lead sit-ins at local businesses. Some of us can remember what it was like, and of course some of us are young enough to have no idea what it was like, but there was as a time in this country, in fact for the fast majority of it, where people of different races were not allowed to share anything; not a water fountain, not a bus, and not even a table. Lewis became well versed in the work of non-violent resistance, and his involvement (and beating and arrests) eventually introduced him to a young man named Martin Luther King Jr. At the time Lewis was 18 and ready to give his life to something, and the young Dr. King was the kind of mentor and visionary who provided it to him. During the sit-in protests Dr. King offered him ways out of the demonstrations if necessary, but John Lewis remained committed, though he almost spent more time in jail than he did protesting. Then Elijah said to him, “Stay here; for the Lord has sent me to Jericho.” But he said, “As the Lord lives, and you yourself live, I will not leave you.” So they came to Jericho. After the Nashville sit-in movement resulted in the desegregation of the lunch counters in downtown Nashville, John Lewis continued to be arrested and beaten as he sought to desegregate other parts of the community. In 1960, Lewis became one of 13 original Freedom Riders, who sought to ride in public buses in an integrated fashion. At the time, even though segregation was outlawed, many southern states refused to let people of different races sit next to one another on public transportation. So Lewis and his companions began riding all over the south. When they arrived at bus stations in places like Birmingham and Montgomery, angry mobs were waiting with KKK members and local police officers to inflict violent retribution before hauling them off to jail. Again, because of the sheer amount of violence, leaders in the Civil Rights movement proposed an end to the Freedom Rides, but Lewis was determined to not let any act of violence keep him and his fellow workers from the goal of freedom and equality. When the Civil Rights movement marched on Washington D.C. in 1963 John Lewis was the youngest individual invited to speak, and today he is the only one left alive. Then Elijah said to him, “Stay here; for the Lord has sent me to the Jordan.” But he said, “As the Lord lives, and as you yourself live, I will not leave you.” So the two of them went on. In 1964, Lewis began leading what would later be called the Freedom Summer in Mississippi in which he non-violently combatted the inability for some black individuals to register to vote. He organized education classed which helped people to pass the voter registration tests, and he invited college students from all over the country to witness the perils of the black experience of the south. The responses from the local communities were harsh and violent, and again, leaders from the movement offered a way out for Lewis, encouraging him to go to other parts of the country for work, but he stayed. And on March 7, 1965, Lewis began leading a march from Selma to Montgomery, and as they crossed a bridge just on the outskirts of Selma, Alabama State Troopers charged the demonstrators while beating them with nightsticks. Lewis’ skull was fractured during the attack, but before he was taken to the hospital he appeared before television cameras calling on President Johnson to bring an end to the injustice in Alabama. To this day, Lewis still has visible scars from the incident. Three years after the bloody events of Selma, Dr. King was assassinated, but Lewis has worked tirelessly over the decades to keep his dream alive. The month of February ties together a handful of narratives. At one moment we are focused on Black History, the individuals and communities that have been long overlooked in the education of young people. At the same time, in the church, we prepare for Ash Wednesday and the beginning of Lent. We do so in the church with what we call Transfiguration Sunday, a day in which we remember that holy moment when Elijah and Moses appeared on the mountain while Jesus was transfigured before the disciples. It is in the reading of the story that we are also called to remember the prophet Elijah who was sucked up on the whirlwind of the Lord, and his disciple Elisha who took up his mantle and continued his prophetic work. All of us have experienced moments of transfiguration, times and events that dramatically reshape the way we experienced the world. If any of us made a map of our lives, there would be those big locations, those massive landmarks of metamorphosis. Those places are obvious in retrospect; they are as big and bold as Gilgal, where the Israelites camped after crossing the Jordan river. Or like Bethel, the sacred temple site. Or like Jericho, where the Israelites famously defeated the city. Those moments of transfiguration could be big and bold as Birmingham, Montgomery, or Selma. These locations are important because they reveal a lens about where we were, but they also play a role in the future as well. When Elisha followed his friend and mentor to the big bold places, he was experiencing the past of the people of God, while also preparing to be handed the mantle of the future. When the disciples witnessed their friend and Lord transfigured before them, when they took in the vision of Moses and Elijah on either side, they were at once seeing the entire history of their people while also experiencing a foretaste of the future. When John Lewis marched and protested in those now infamous moments, he was carrying the history of an oppressed people, while believing in a dream that was handed to him by his friend and mentor Martin Luther King Jr.
We are who we are because of the people who paved the ways for us, and the transfigured moments that show up on the map of our histories. However, the most transformative moments tend to happen outside of the big landmarks, in the days of everyday living. It is there in the ordinary moments that life is disrupted in ways both strange and superb. Transfiguration takes place in the conversations between a prophet and his student on the way to the next town. Transfiguration takes place at a table when a teacher shares bread and a cup with his disciples. Transfiguration takes place in the linked arms of a protest line outside of a no name diner. And that is why we celebrate the Transfiguration of Jesus on the mountain. It is why we remember the journey of Elijah and Elisha from one place to the next. It is why we take the time to learn about the struggles of a people in this country, who are still suffering under the weight of prejudice and racism even today. Elisha, the disciples, and even John Lewis were given plenty of opportunities to leave. There were moments when the path before them was clear, and knowing what was at stake did not deter their vision. The work of the Lord, of going to the margins for the sake of people on the margins is no easy task. For many, it results in punishment, isolation, and even death. Yet staying the course resulted not only in their transfigured lives, but also in the transfiguration of all things. Elisha and Elijah were standing by the Jordan river when Elijah rolled up his mantle and struck the water. And, just like in the days of Moses, the waters were divided to let them pass to the other side. In their final conversation, Elisha asked the prophet for a double share of the spirit, and Elijah was quickly lifted up on the whirlwind of the Lord as Elisha looked on with terror. And when Elijah was finally gone from sight, Elisha tore his clothes into two pieces. The disciples who were on the mountain with Jesus during the Transfiguration stayed with him almost until the end, when he was hung on a cross for all to see. And in the wake of his suffering and death, they wailed and lamented in grief. John Lewis continued the hard and challenging work of the Civil Rights movement knowing that his life could’ve ended many times, and that it could’ve ended with a gun shot just like his friend who dared to dream. That is why we remember. That is why we take the time to read the stories, and sing the songs and offer the prayers. Because these stories are who we are. We are there with Elisha crying out into the void, we are there with the disciples shielding our eyes from the brightness of the Transfiguration. We are there with John Lewis marching across the bridge toward certain doom. We do this because it is in the looking back, that the light of Christ shines before us propelling us back down the mountain, across the river, or even over the bridge. We are propelled back to the future seeing how far we’ve come while also knowing how far we still have to go. Amen. He went up from there to Bethel; and while he was going up on the way, some small boys came out of the city and jeered at him, saying, “Go away, baldhead! Go away, baldhead!” When he turned around and saw them, he cursed them in the name of the Lord. Then two she-bears came out of the woods and mauled forty-two of the boys. From there he went on to Mount Carmel, and then returned to Samaria. This morning we continue with the second part of our sermon series on Strange Stories from Scripture. As I mentioned last week, the drive for our sermon series comes from the wealth of scriptural treasure begging to be preached, in addition to my desire to not fall into a rut of preaching the same, favorite, and familiar texts over and over. Last week we talked about the fate of a young man named Eutychus who fell asleep during church. Today we are exploring the story of Elisha and the she-bears. In my opinion, this is one of the most troubling passages in all of scripture. I can look into both the Old and New Testaments and find scriptures that challenge my faith, passages that require me to pray for understanding and discernment, there are even passages that I would rather ignore than affirm from a place such as this, but there are few stories as dramatic and frightening as the one we have read this morning. While Elisha was on his way to Bethel, sweating under the heat of the sun, some young boys came out from the city ahead of him and began to make fun of him. “Get outta here baldy! We don’t want you and your shiny head around us!” Perhaps he tried to ignore them at first, but when the taunting became so distracting and loud, Elisha turned around to face the crowd of young boys and cursed them in the name of the Lord. As if on cue, two mama bears came barreling out of the woods and mauled 42 of the boys. From there Elisha continued on his journey to Mount Carmel, and then he returned to Samaria. Before we can even begin to address what happened on the road we need to go back, we need to get a larger picture of the story. 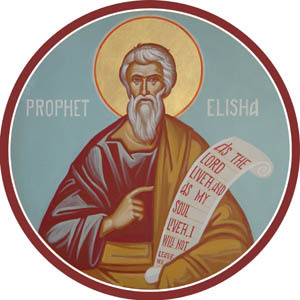 Elisha followed the reign of the prophet Elijah. Elijah is remembered for bringing a widow’s son back to life, for finding God in the sheer silence, and for confronting idol worshippers. Elijah was a favorite prophet for the New Testament writers who often drew the connection between the prophetic life of Elijah and the messianic life of Christ. At the end of Elijah’s time Elisha followed him to the Jordan and watched him ascend on a whirlwind into heaven after having received a share of Elijah’s spirit. Elisha took up Elijah’s ministry, he literally took Elijah’s mantle with him, and continued to be a messenger and example of God’s Word for the people. The story of Elisha and the she bears is one of the first things that took place during Elisha’s time as a prophet. As a young and novice messenger, he is making his way to Bethel and other parts of the land to bring the people back to their Lord. What do you make of this passage? Is it one that you, like me, would rather ignore and pass over? Does it challenge your understanding of God and the role of the prophets? For centuries theologians, scholars, pastors, and Christian-disciples have attempted to make sense of this story; they have worked hard to explain what is really going on. I could begin by telling you that there is more at work in this story than appears on the surface. In Hebrew, the designation for the “small boys” is more akin to “young men” and more particularly young men who do not want the prophet coming to their town to tell them what they have done wrong. I could continue by showing you that, though Elisha was bald, he was in fact probably only 25 or 26 when this transpired; he was my age when he was taunted for being bald and cursed the young men! Similarly the point can be made that the harmless teasing was in fact very troubling. They were not merely making fun of his shiny head but were denying his prophetic ability. After taking up his former prophet’s mantle, Elisha was being accosted; in so doing the crowd of young men was not only attacking a young prophet but denouncing the Lord as well. Moreover I could share with you the simple fact that Elisha did not call out the she bears, he just pronounced judgment on the demonstrators and God decided the form of response. And even when the bears came out of the woods they did not kill 42 of the young men, they simply mauled them. 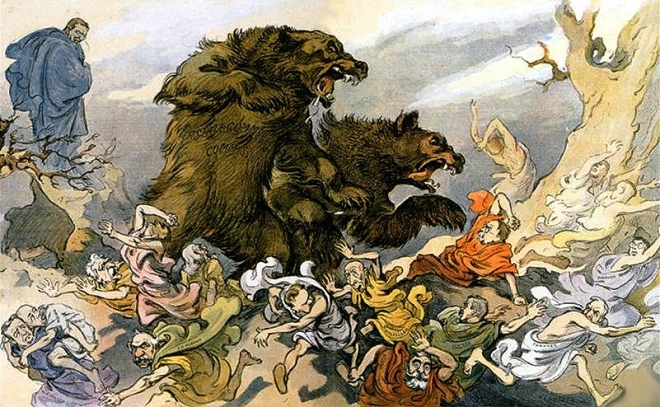 Perhaps God was using the bears in a way that none of the young men would perish, but so that they would all be punished. Yet, even with all these new details, the story still troubles me. As I prepared for the sermon this week I consulted numerous commentaries on 2 Kings and I was shocked to discover some of the reflections regarding this passage. I am now going to do what many of my professors warned me about in seminary, I am going to preach against this text. Whereas many scholars, pastors, and Christians believe that the children are at fault, (I agree, they are) I believe that Elisha is just as at fault for his quick curse of the bullying boys. With the rise in expectations of pastoral ministry, coupled with dying churches and lowered pay, its no wonder that many pastors abandon their flock. When many churches are running on financial fumes, while also expecting their pastors to continually go above and beyond their call, the result is a collection of pastors who are burned out and have lost sight of the Lord and their calling. I imagine the Elisha felt a lot like ministers in the first few years of their appointments. After all, Elisha found himself following in the steps of the renown and powerful prophet Elijah who no doubt cast a great shadow for the young prophet. Most of the people would be evaluating this young man based on the actions of his predecessors. This wasn’t something that Elisha inherited but was called into. He could have remained a farmer, tending to the plows with the oxen, but instead he was called out of his life into something new, strange, and at times, terrible. As a bright-eyed and bushy-tailed prophet, Elisha had everything to prove. And here in 2 Kings 2 Elisha find himself at the beginning of his ministry filled with passion for the Lord when a crowd of youngsters attack him for that very call. I think that Elisha’s pride got the better of him when he was walking to Bethel. Unlike the Son of Man who would one day tell his disciples to turn the other cheek and love those who persecute you, Elisha immediately cursed the youngsters and they were mauled. If this story is about what it means to be a prophet who speaks the Word of the Lord, then I would argue that the biggest take away is that we must be very careful with our prayers. God listens to our prayers and He answers them, sometimes in ways that we do not want and sometimes in ways that we do not expect. Be careful what you pray for. When I arrived at this church I felt very much like what I imagine Elisha felt like at the beginning of his prophetic ministry. I was following in the footsteps of countless pastors who have shaped and nurtured this congregation into what it is today. I recognize that I will always live in the shadow of the likes of Fletcher Swink, Zig Volskis, and Patricia Meadows. I sat in my office the week before my first sermon and thought about everything I had to live up to. I stewed over what my reputation would be at this place. I over-analyzed every word and sentence for that sermon, fearing how I might be received. I stood in this pulpit over a year ago, afraid of how all of you would respond. And, if I’m being honest, I stand here this morning still consumed by thoughts of what you think about these words, my delivery, and the connections with scripture. Being a pastor is, at times, terrifying. Many weeks pass when I feel like I did not get enough done. There have been a number of Saturday nights that I lay awake in bed rehearsing in my head what I will be saying on Sunday. I have had many tough conversations with families, couples, and individuals about the sins in their lives. There have been countless visits when I wonder if I have actually helped at all. And its when I reflect on all of these elements of ministry, that I realize how difficult it must have been to be Elisha. I begin to understand why he was so quick to curse those young men who spoke against his calling. And the more I think about it, the more I see connections not only between Elisha and pastors, but also between Elisha and all of us. How quick are we to curse those who speak against us? How inclined are we to forget our discipleship the minute our calling is called into question? I know of an older gentleman who had not exchanged a word with one of his sons in years because of a foolish argument they had in the past. I know a woman who refuses to shop at certain stores in our town because of the color of some of the employees. I know neighbors that never wave or acknowledge one another because one of them went to Virginia Tech and the other went to UVA. In today’s world it is too easy to put a tremendous amount of pressure on ourselves to shine brightly in the darkness. We set goals for ourselves that are lofty and unreachable. We expect greatness from our lives and the lives around us on a daily basis. When we get caught up in the expectations of the world that we place on ourselves, we fall into the trap of quickly cursing others around us. When we fail, we jump to blame someone else. When we miss the mark we can come up with a list of excuses faster than we can come up with better solutions. Being a pastor is hard, but being a disciple is harder. We are called to walk in the world as prophets, seeing this created place through God’s eyes. We have the unenviable task of reaching out to the last and the least and the lost. We have been baptized into a new order where the world has been turned upside down. When we are accosted for out faith, when we are judged for our Christian allegiance, it will manifest itself in different forms. Elisha was made fun of for being bald. You might be attacked for praying in public, for wearing a cross around your neck. You might be made fun of for offering up your gifts and tithes to a place like the church. You might be judged for praying to a God who often responds in silence. But nevertheless, we are not called to respond to these threats by cursing on enemies. We have been commanded to love them. What a crazy and wonderful thing it is to be a disciple of Jesus Christ. Amen.